The Mats of Love project at Hubbard Public Library began with a woman coming into the library and being brave enough to ask at the reference desk where she could get a free shower. The courage that takes is to be respected. She was referred to me and I was able to get her to an agency that could assist, but I felt that we needed to be doing more. 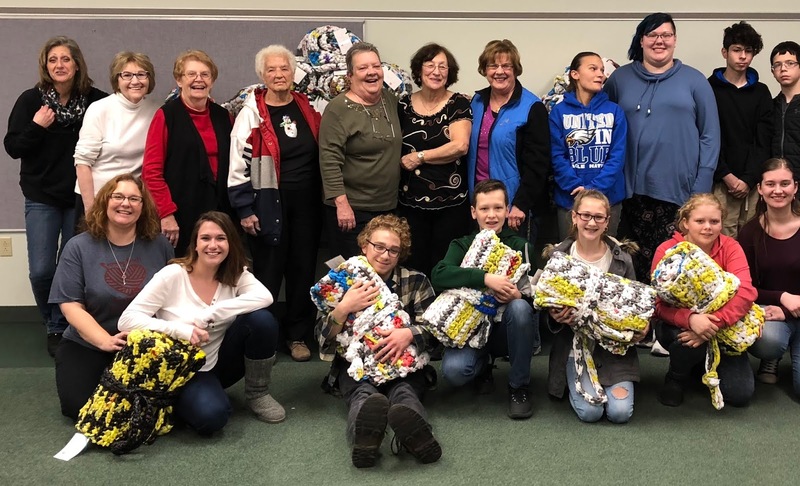 The following week, the Youngstown Blue Coats spoke about their distribution missions for people experiencing homelessness. Mention was made of Kim and Mac Pasco and the mats of love they were creating. Kim agreed to teach any interested patrons how to crochet the mats. Hubbard Public Library would become a creation and donation site for the mat program. Kim taught our group how to crochet the mats and prepare the plarn. Multiple generations of volunteers came in to cut, loop and crochet the bags into mats. Teens came in each week and did the preparations as part of our Summer Reading program to earn points to attend our annual overnight lock in at the library (this was just one of their summer reading sessions). Adult patrons came in to crochet and that is where the magic happens: adults and teens sharing stories, talking about life while creating items to comfort others. Each group learned about the other. Each group found new traits and characteristics to respect in one another. During the course of those 8 months that the project grew: a wonderful woman crocheted and donated 12 soap bags with soap for distribution, a large number of crocheted hats were brought in that were crocheted by a group of incarcerated individuals and two local community groups requested our pattern and instruction to start the project on their own. 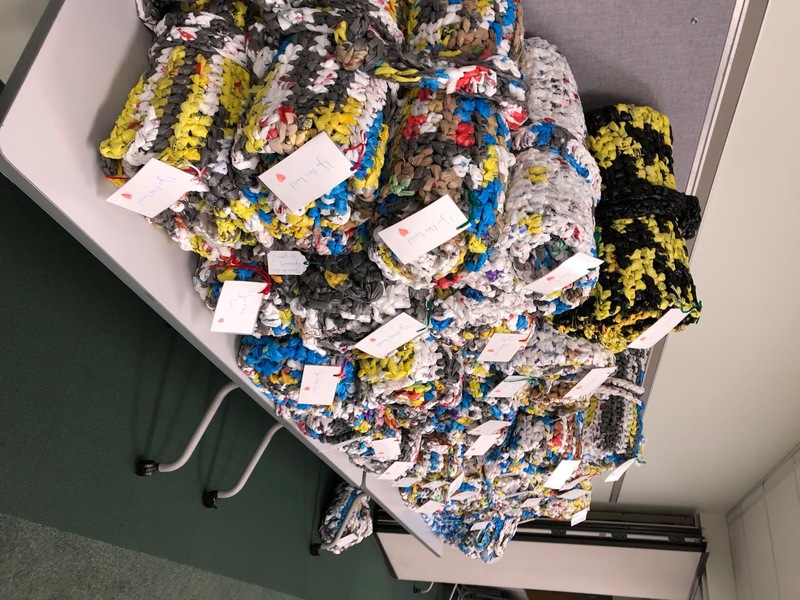 This all resulted in 44 mats being donated To Youngstown Blue Coats at our dedication program on December 4 at Hubbard Public Library. More than 20 of our volunteers of every age joined us as we heard from Kim and Mac Pasko about the beginning of their mat project. Patty Summers spoke about the Youngstown Blue Coats and the Hubbard Library Coordinator of Teen and Patron technology Services, Amy Zell, distributed canvas totes and t-shirts screen printed in the teen room with a yarn hear t design and the words: warm hearts changing lives at Our Place in the HPL Teen Room as a thank you to the volunteers. The program will continue as long as volunteers are available. During winter months, teens participate after school at-will and adults come in on Tuesdays at 1:30 pm. For additional information, please contact Amy Zell via email at amy@beyond-books.org or stop in on a Tuesday at 1:30 pm.